3x10 Wicker Polished Brass Floor Register Discounts Apply ! 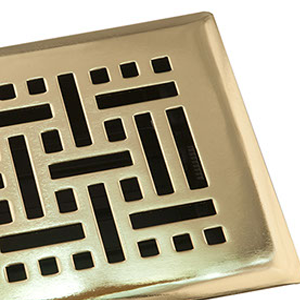 Decorative air registers with a polished brass finish will help your home be a standout. Brass floor registers are the perfect way to brighten up any room. More than a decorative air register these have fully functional dampers and can hold up to 200 lbs. Brass floor registers have a protective non-tarnishing coating. Decorative air registers are an easy to install drop-in style, perfect for the do it yourselfer. Brass floor registers have a sturdy steel core. Decorative air registers are a great fit with any style of decorating. ***Hint: The industry standard is to order using the actual hole opening size and not the faceplate size. This polished brass wicker floor register will fit a 3 x 10 inch hole opening. 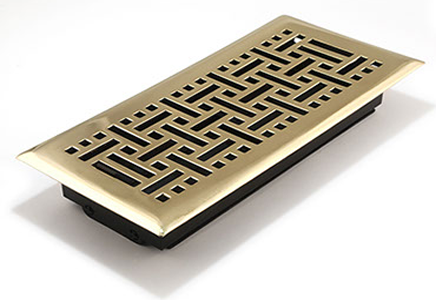 Decorative air registers are available in many sizes and in a variety of finishes. Brass floor registers are a great way to update your home. Order them today!